Nanyang Technological University, Singapore (NTU Singapore), global technology leader HP Inc. and the National Research Foundation Singapore (NRF) today announced the new HP-NTU Digital Manufacturing Corporate Lab. As Singapore's newest corporate research laboratory and HP's largest university research collaboration worldwide, the HP-NTU Corporate Lab will drive innovation, technology, skills and economic development critical for the advancement of the Fourth Industrial Revolution. This is HP's first university laboratory collaboration in Asia. The $84 million lab supports Singapore's push toward industry transformation – in the areas of digital manufacturing and 3D printing technologies. Advanced Manufacturing and Engineering is one of four technology domains under the Research, Innovation and Enterprise (RIE) 2020 Plan, which is Singapore's national strategy to develop a knowledge-based innovation-driven economy and society. The lab's 100 researchers and staff will focus on digital manufacturing technologies, specifically in areas of advancing 3D printing, artificial intelligence, machine learning, new materials and applications, cybersecurity and customisation. The partnership was inked today by NTU Vice President (Research) Professor Lam Khin Yong and HP Chief Technology Officer and Head of HP Labs Mr Shane Wall. 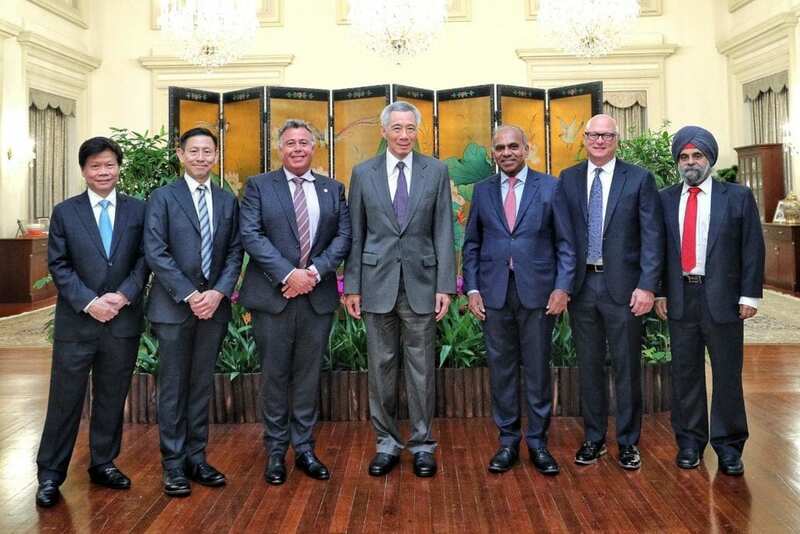 It was witnessed by Guest-of-Honour Minister for Finance and NRF Chairman Mr Heng Swee Keat, NTU President Professor Subra Suresh, and HP Inc. Chief Executive Officer and President Mr Dion Weisler. NRF CEO Professor Low Teck Seng said, "Corporate laboratories are an integral part of our strategy to anchor joint R&D partnerships between our universities and companies in areas that have direct relevance to the growth of industries in Singapore. The HP-NTU Digital Manufacturing Corporate Laboratory is significant to our long-term competitiveness in the advanced manufacturing sector, and ensures that we stay relevant in the Fourth Industrial Revolution that is evolving and growing rapidly world-wide. It will also strengthen our capabilities to support multinational companies for expansion from Singapore into the region." "NTU has established deep capabilities and is a recognised leader in the areas of machine learning, data science and additive manufacturing. These cutting-edge technologies are now an integral part of NTU's education and research ecosystem, and the NTU Smart Campus serves as a test bed for them. This is aligned with Singapore's vision of transforming into a Smart Nation," Professor Suresh said. "Together with HP Inc., a renowned innovator and leader in the tech industry, NTU seeks to address today's fundamental challenges with solutions that will benefit both industry and society in Singapore and the world, such as developing automation that is capable of boosting manufacturing productivity," he continued. "The World Economic Forum estimates more than $100 trillion in value will be created by digital transformation across all industries in the next 10 years," said Dion Weisler, CEO and President, HP Inc. HP is helping lead the development of the underlying technologies, like 3D printing, that will enable the benefits of this transformation. Singapore is one of our key worldwide technology development and manufacturing centres in Print technology. The HP-NTU Digital Manufacturing Corporate Lab will significantly deepen our involvement here and serve as a nucleus for this ecosystem. We are proud to collaborate with NTU and we are looking forward to this becoming a blueprint for innovation, collaboration and economic progress." The new Corporate Lab will be a key pillar of NTU's Smart Campus initiative and will build on HP's strong research and manufacturing capabilities. "One out of every three jobs worldwide, more than 30% of global GDP, and nearly one-third of carbon emissions are related to manufacturing," said Mr Weisler. "We are committed to innovating with purpose, not only driving the technology breakthroughs that improve HP's business but also contribute to creating economic opportunity and improving people's lives." Ranked 12th in the world, NTU has also been placed the world's top young university for the past five years. The University's main campus is frequently listed among the Top 15 most beautiful university campuses in the world and it has 57 Green Mark-certified (equivalent to LEED-certified) building projects comprising more than 230 buildings, of which 95% are certified Green Mark Platinum. Apart from its main campus, NTU also has a campus in Singapore's healthcare district.